The first dummy regular superconducting double pancake wound by MELCO in MHI's Futami factory. Each toroidal field coil is constituted from seven double pancakes. 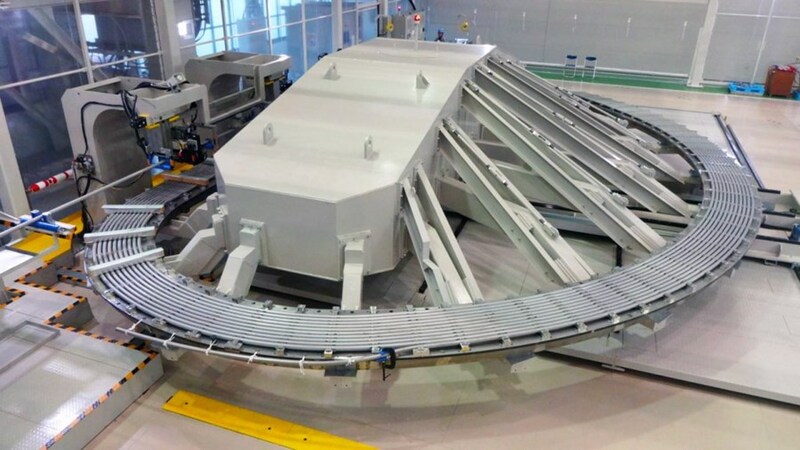 For the past 12 months, the European and Japanese Domestic Agencies and the ITER Organization have been engaged in a common procurement project for the production of 19 toroidal field coils (including one spare). Europe (with the procurement responsibility for ten coils) and Japan (with responsibility for nine coils plus nineteen encasing coil structures) collaborate through regular meetings that bring together representatives of the ITER Organization and industrial suppliers to resolve common toroidal field coil system issues and to manage the interfaces and tolerances between the winding packs and the coil structures. ITER's 300-tonne, 14-metre high toroidal field magnets will be the largest and most powerful superconductive magnets ever manufactured. "Throughout all the phases of toroidal field coil fabrication—from process qualification, to the start of series production, to the delivery of the coils—professional teams around the world are endeavouring to harness the most mature industrial technologies in order to solve problems in real time and develop the best compromises and solutions," says Arnaud Foussat, ITER's Toroidal Field Coil Section leader. At Mitsubishi Heavy Industry's Futami plant, participants to the meeting are photographed in front of the new MELCO transfer winding tool. 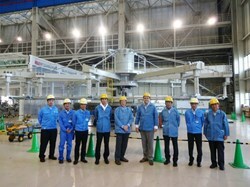 Left to right: Tomohiro Okawa, Takashi Miyake and Naoki Sawa (MHI); Hideki Kajitani (Japanese Domestic Agency, JA-DA); Neil Mitchell, head of the ITER Magnets Division, and Arnaud Foussat, Section leader and Technical Responsible Officer; Norikiyo Koizumi (Technical Responsible Officer for JA-DA); Katsusuke Shimizu (MHI); and Yoshinobu Yamanaka (MELCO). 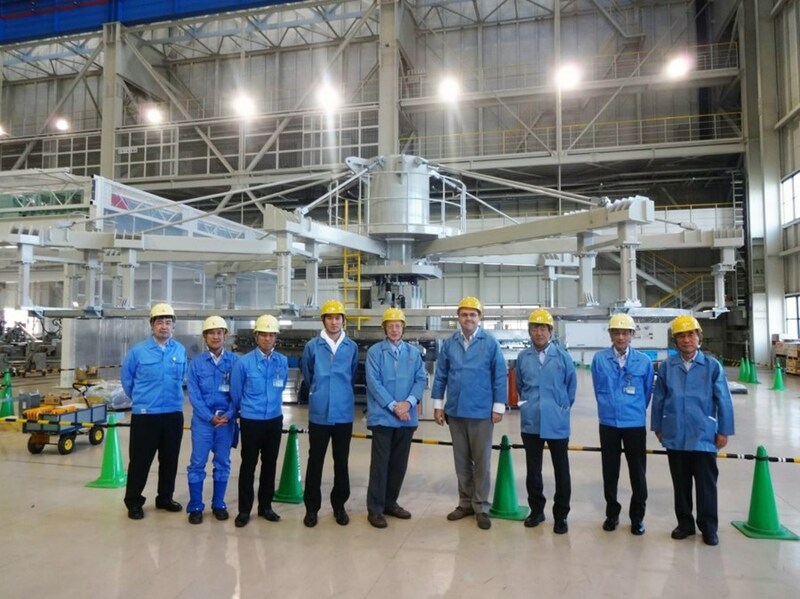 During a recent visit to Japan, ITER representatives attended a toroidal field coil progress meeting at Mitsubishi Heavy Industry's Futami production site. Large efforts have made by Mitsubishi Heavy Industry and Mitsubishi Electric Corporation (MELCO) to keep to and control the planning of the production of the first dummy regular superconducting double pancake winding. The latest progress meetings have demonstrated that, in order to share knowledge and limit production risks, regular communication between the various toroidal field coil manufacturers and the ITER Organization's toroidal field team that owns the design is essential. The real-scale dummy double pancake winding will be the last qualification step before the start of first-of-series double pancakes. Seven double pancakes will constitute one toroidal field winding pack. Winding toroidal field conductor into the complex geometry of double pancake windings is achieved through the very precise control of successive turns within a few tens of ppm using dedicated and accurate automated tooling for winding and bending. Such short-series industrial prototype realization is of similar complexity to the high technology world, where resources consistently deliver breakthrough innovations requiring technical re-adaptation and effective project tracking. "As project managers, we need to focus on managing constant flux, fabrication steps, re-planning and shifts in design direction through tight interaction with suppliers and allocating resources as needs shift." Continued close collaboration with the procuring Domestic Agencies and their suppliers will be the key for fast iterations, quick and nimble planning, and successful tracking to monitor converging goals on the toroidal field coil challenges that lay ahead such as integration and commissioning.